Free beginner sheet music "Cowboy Song" has a repeating left hand boogie chord, and solid right hand chords for a full sound. Especially popular with boys! 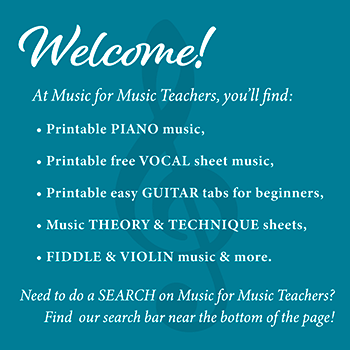 This printable piano music is most appropriate in the second year of piano playing, for most students. It takes a bit of coordination to execute the two hands together. I never give them this piece until they have become very familiar with the "boogie" left hand open chords that accompany a simple 12-bar-blues pattern, in my studio. They'll come back Week 2 playing "c, f, g, f", instead of "c, g, a, g" as written! Separately, each hand is very easy. Together, students MAY have trouble, initially, bringing left and right hands together on beat 3 of measure 3. I let them try to put it HT (hands together) right away, but if they have trouble coordinating the hands, I tell them to just go to the end of line 1, or even just to the end of measure 4, for all of the 1st or even 2nd week. And if they have a little trouble, I say, "Can you pat your head and rub your tummy at the same time?" I demonstrate, and watch them do the same. It's very fun! Of course, not all can perform this feat of coordination very gracefully, and I tell them that over time it will improve! Just like Cowboy Song will improve. One suggestion for actual lesson time: as you play along with them, tell them to slow the notes down as they approach the tricky part to SUPER SLOW, "freezing" the hands as they meet. This will help the hands memorize the feeling they must have as they come together. Note that this free beginner sheet music is to be performed with a swing; a LONG-short, LONG-short rhythm. This really does, somehow, suggest the motion of a horse and cowboy moving along. Must be all the Western movies soundtracks with the same loping kind of rhythm our ears have come to identify as the "cowboy" sound! The song really has more of a cut-time rhythm (2/2), but I wrote it 4/4 to make it easier to read. This piece is especially popular with boys; for some students, it marks a new milestone as they struggle with the challenge of two-hand coordination... and they feel rewarded when they can play it with ease!